WordPress is one the best blogging platform or for creating business website or store, Its widely used and because of its features and accessibility customers are loving this. Now I am going to explain how to create a website with WordPress step by step guide. Now am going to explain how to select and install themes, theme customization and adding plugins into it for creating professional WordPress website – A complete step by step guide on creating a professional website in WordPress. I hope after login, you are also seeing the similar interface, here in the dashboard you can see the summary status of your blog post, comments, pages and recent activity you will be doing further. Post: Here you can see your articles or content for blog section, or from here you can create a new content by clicking on Add Post button and then it will open a new post editor, where you can write about any topics and select the category, tags, featured images. I suggest please watch below-attached video for complete information. Media: You can add and manage your images, videos, ppts, pdf and any other files, which you are allowing users to access. You can edit, delete or rearrange them. Pages: This section helps you to create pages for the homepage, about us, contact us or products pages. You can create a new page, edit the theme and do modification as per your requirement. Also, use some page builder tools for better page designing. Comment: Here you can check the number of comments and you will allow them to publish or move to trash or spam box. Complete control of comment on your entire website. Appearance: Here you can edit the website layout from code or by using front-end editors, customize widgets and menus. This is one of the most important parts of WordPress, which allows you to do a modification on design and layout. You can add new themes and customize the theme as per your requirement. Plugins: WordPress is very popular because of its features, and maximum features are prebuilt with plugins. In this section, you can directly search plugins as per your requirement and install them into the website. User: You can manage your users into a various category based on their authorization and accessibility level. You can add new users, modify the theme or delete them. Tool: This section helps you to import or export files from different places or bloggers to WordPress. Settings: Here you can do the basic settings related to general website setting, titles, descriptions, URL structure or discussion, users, image size details. 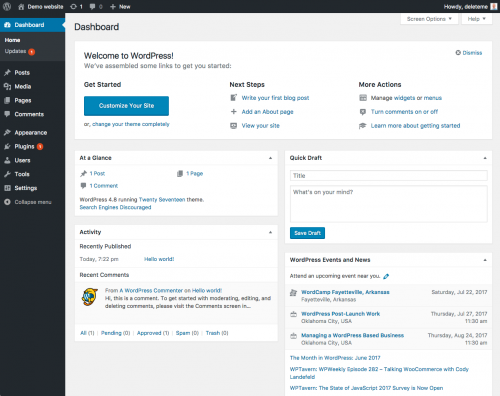 This is a basic WordPress template features, once you install new theme or plugins new options are going to be added to this list. I suggest please watch below-attached video for complete information. For selecting WordPress theme based on your niche you can directly go to “Appearance” section and click on the “Themes“. Now you can only see the installed themes into the website, to add new theme click on “Add New” button and now you can see on the right-hand side a search box. Whatever is your niche, just write like, news, blog, tech or shop. Based on that it will show you some themes, you can select and click on install. Installation started, after installing click on “Activate” button. Now your theme is activated and applied to WordPress. I suggest please watch below-attached video for complete information. After installing themes, it may ask you to install and activate some plugins. Click on it and activate all plugins. To customize title and description go to appearance and click on customize, It will open an interface from there you can change the titles, logos, description and some other things. The different theme has different options, so you may see different options into your template appearance. To customize website menus, go to Appearance then select menu. Here you can edit the menu items and links. From Post and Page, you can create new blog post and pages based on your requirement. To change blog sidebar go to Appearance then click on widgets, here you will sidebar options. Here just drag the item from the left side into right side inside blog sidebar options and click on save. To change footer go to Appearance then click on widgets, here you will sidebar options. Here just drag the item from the left side into right side inside footer options and click on save. Here based on the theme you can see 3 footer or 4 footers. I suggest please watch below-attached video for complete information on how to create WordPress website step by step guide with an example. I hope my video tutorial will help you to Create A Website With WordPress Step By Step, If you have any query or facing any problem comment below with your website link. I will try to solve as soon as possible.